Every great date ends in dessert. And take that as you will. This one was particularly nice. We had dinner. I was full. Dessert Date suggested…something sweet. He is sweet. We agreed to get something chocolate, like a piece of cake. 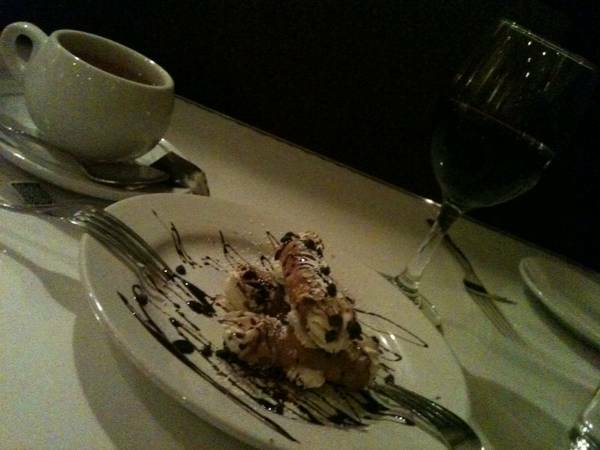 Ended up sharing cannoli, wine and a cup of tea. Even better. Sat holding hands and gazing longingly into each other’s eyes. Holding each other across the table. Staying long after the restaurant should have closed. Yeah, I may be dreaming. If I close my eyes and wish, will it happen again? Such a sweet, sweet dream.